Kat, a student at CultureWorks in Holland, uses her drawings to illustrate the physical manifestations of various mental illnesses. This piece represents Kat's vision of anxiety. This piece represents Kat's vision of eating disorders. Artists create for all sorts of reasons: to express emotion, convey an idea, or raise a political ruckus. For people who struggle with anxiety and depression, art can also be a kind of therapy. Creating Connection Michigan is a series of intimate, first-person stories about the powerful impact that art can have on both individuals and communities. This week’s story comes from sixteen-year-old Kat from Holland, Michigan. She tells us about her time at CultureWorks, a youth arts program that helped her deal with mental illness and rebuild her confidence. Kat has experienced serious bullying throughout her life and says her school offered little support. 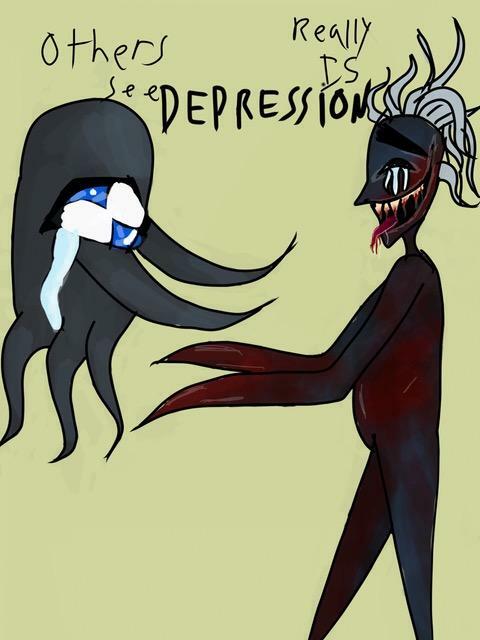 Kat says she uses her drawings, which she calls her “mental monsters,” to illustrate the physical manifestations of mental illnesses in order to better understand them. “My art helped me... be like, ‘No that's not me! It's not me that I hate. It's these monsters that I hate,’” Kat said. Being at CultureWorks has improved Kat’s sense of self-worth, and she says being in that space makes her feel like she can succeed. You can find the full transcript of Kat’s story here. MCACA Creating Connections // CultureWorks // Holland, MI // Kat from Long Haul Productions on Vimeo. Creating Connection Michigan is a series of intimate, first-person stories about the power of art to change lives. This week, we hear from a Kalamazoo woman whose art-making helped her cope with tragic losses. At its core, art is about connecting with other people — whether that’s in an art gallery, a concert hall, or an afterschool program. Over the next five weeks, Stateside will bring you a series of intimate, first-person stories about how creative expression brings us closer to other people, the community around us, and ourselves.